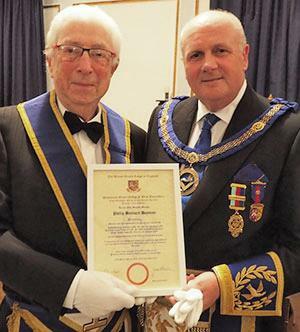 When nearly 90 people turn up to celebrate a brother’s 60 years as a Freemason, it says that bit more about the man than just his staying power as a Mason. It tells of somebody who has affected the lives of others and done so in a very positive way. So, what was happening in 1959, the year that Philip (Pip) Hayman was initiated into Freemasonry? Pip Hayman (left) receives his 60th year certificate from David Winder. Here are some unique events from the year 1959: Fidel Castro took power in Cuba. Buddy Holly died in an aeroplane crash in Iowa. The iconic Mini motor car was launched, possibly to grace the first section of the M1 Motorway between Watford, and Crick. It was the year that the Motown Record label was founded, the Barbie Doll was launched and Charlton Heston starred in the film Ben-Hur. Philip Hayman, or ‘Pip’ as he prefers to be called, was born in Sheffield on 23 November 1931. His father Harry and mother Rose were in the fashion retail clothing business and owned two or three shops in Sheffield and surrounding towns. Pip had a sister, Bonita, who is sadly no longer alive. Due to his ill health, Pip’s mother arranged for him to move to the country. He loved it there, it was a boy’s dream. A hands-on farm life dealing with horses, animals and even a pond to fish in. Pip’s adopted family provided him with a welcoming and happy new family. Pip recalls that on his arrival he didn’t want to go home, resulting in his clothes having to be posted to the farm. The farm was basic, no running water, electricity or gas. Candles needed to climb the stairs at night where he slept in the same bed as his uncles. Oil paraffin lamps in the living room and a wood burning stove. The only water was taken from a well outside, with only very basic amenities. All this was an adventure with his uncles immersing him into farm working life. Everyone had to ‘pull their weight’. Pip remembers riding one of the horses in the working team alongside his uncle. Pip Hayman (left) with his old friend Barry Cuttle. His aunt Nellie, who was so caring that Pip used to call her Auntie Mum, treated him like her own son and would take him on the back of her bike the eight miles each way for piano lessons. Pip attended a local school, made friends and all was idyllic until at the age of nine and on the eve of war his world was shattered, for he was required to return home and attend Worksop Preparatory School. Pip is still amazed at the simple fact that within a school of 500 pupils, all Church of England, he was practically the only Jewish boy there. The effect over the years was that Pip is fluent in the knowledge of both Judaism and the Church of England. Ironically Pip was placed in Mason House one of six houses in the school. Life was harsh and draconian with the strictest of discipline. The food was dire and the prefects were bullies. Sport was compulsory, hockey in the spring and cricket and rugby in the summer. Pip had taken up boxing early on. Pip found that boxing skills allowed him to ‘punch’ above his weight; highly useful in bully prevention! Sport occurred every day of the week with a long walk or dawn run every day, school days starting at 6am. The result was that Pip left school strong in character and resistant to being bullied or told what to do. He had survived as a Jewish boy in a C of E school for eight years. He could now deal with anything that life would throw at him. On leaving school Pip was called up into the RAF where he found military life an absolute breeze and like a kindergarten in comparison to his school. Pip had applied for aircrew but flat feet put paid to that. The fact that he had received education gave access to 40 role options with a preference listing of five. In typical military fashion Pip was assigned the least palatable option, that of dental clerk and he was shipped off for suitable training. Fortunately, the dental training establishment was next door to the cookery school and for a ‘consideration’ Pip had his breakfast served to him in his quarters. The other advantage was there were WAF’s on site, which Pip quietly described as a ‘bonus’. After 2 years in the RAF, Pip went to work with his father, despite the temptation of signing up for a five-year commission. After working for four years with his father he took a lease on a shop and opened up for business in ladies accessories, blouses and swimwear in what would have been known at the time as a separates shop. During this time Pip had married Valerie and they had been blessed with 4 children, 3 girls and a boy but sadly they divorced after 18 years of marriage. The shop selling separate’s was not doing too well and it was at the suggestion of Pip’s uncle, a bookmaker, that he changed the shop into a betting shop, receiving much advice and assistance from his kinsman. Pip enjoyed 30 years in this trade until Coral, Ladbroke’s and William Hill cornered the business for themselves. However, during this time Pip had a second job working as a croupier in a casino run by a friend. It was there that he met his current wife Janice. When the bookmakers shop closed, Pip didn’t stray far from the core business and found himself owning a 12-acre farm, which he converted into a riding stables with 10 horses. David Winder (left) receives a gift for his wife Sue, from Pip Hayman. Ever the entrepreneur, Pip decided to go back into fashion and opened a shop selling exotic clothing imported from Pakistan. Leading on from this, it was suggested by Janice that they branched out into selling bespoke clothing for punk rockers. The shop became an icon of fashion, with people even coming to buy the small and ‘want to be seen with’ carrier bag with the ‘Pip’s shop’ logo upon it. All was well until the advent of Meadow Hall shopping precinct which saw a down turn in business. A chance holiday meeting in Thailand with a Blackpool family led to a move to the town in 1996. Pip took a studio on Queens Promenade for £55 per week. In the opinion of Janice: “You can’t swing a cat in here”, to which Pip replied: “We haven’t got a cat”. They lived and worked there for four years. They then moved to take on a swag shop on Lytham Road near to the bus station. They had gone from selling Punk Rock to Blackpool Rock! Pip joined Freemasonry with the assistance of Valerie’s father and was initiated into Hadassah Lodge No 4871 in Sheffield in the Province of Yorkshire West Riding on 23 March 1959 and was passed and raised in the same year. On 23 May 1960 Pip was exalted into Welcome Chapter No 3779. In Hadassah lodge Pip progressed through all offices leading to the master’s chair in 1975. Ironically, he had wavered slightly half way along the offices leading to that chair but all had been restored when he was able to deliver the second degree tracing board, only having delivered working tools prior to that. After successful delivery Pip realised that he could take on any Masonic ritual with confidence. The social highlight of Pip’s master’s year was the Ladies Evening where at the festive board he was supported by his mother on one side and Auntie Mum (Nellie) sat proudly on the other side. In May 1969 Pip became a member of his old school lodge, Old Worksopian Lodge No 6963, in the Province of Nottinghamshire, being installed as master in 1981. There are still six of his old school chums in the lodge which Pip still attends regularly. Pip became DC in Hadassah Lodge in 1982, holding that office for 5 years. In 1985 he joined St Audrey Chapter No. 3849 in Yorkshire West Riding. He acted as chaplain from 1985 to 1988 and was chaplain of Old Worksopian Lodge from 1994 to 2014. Pip’s services to Freemasonry in Yorkshire West Riding were first recognised in 1984 with an appointment to Past Provincial Junior Grand Deacon, with further promotion to the high rank of Past Provincial Junior Grand Warden in 1993. He also holds the same rank in the Province of Nottinghamshire having been appointed in 1999. Sadly, in 2000 Pip had to resign from Hadassah Lodge due to ill health. In January 2008 he was delighted to be able to re-join the lodge his health having improved. Pip and David Winder surrounded by the Sky Blues. On moving to West Lancashire, Pip’s route to find a lodge was unusual and unique. His cousin, Roger Kitter, is a member of Chelsea Lodge No 3098 in London, which is the entertainers lodge. He was appearing with Jim Davidson, who was working the season at Blackpool. As a result, Jim Davidson asked Pip to attend a lodge meeting with him at Symphony Lodge No 4924 in Blackpool. Pip was introduced to Clive Cope and Steve Smith, who took Pip under their wing. Further invitations saw Pip meet Leon Tax, John Forster and his great and sadly missed pal, Billy Taylor. Billy always invited Pip to Lytham Lodge No 6915 and would never allow him to pay. After many attendances however, his cunning plan bore fruit as on 11 February 2004 he proposed and Tom Goodier seconded Pip as a joining member of Lytham Lodge. Having joined, Pip was asked after just two weeks, to be junior warden. Two years later in 2006 Pip found himself in the master’s chair of the lodge, although his take on ritual was a mixture of Emulation and Taylors working, which was not to be found in any books they had ever learned from. Pip also joined Senatores Lodge of Installed Masters No 8966 in 2002, Semper Fidelis Mark Lodge No 880 and has been installed President of Sheffield Past Masters Association. In 2014 he was appointed to the rank of Past Provincial Assistant Grand Sword Bearer. 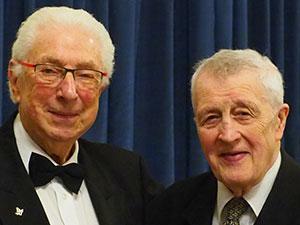 In his 80th birthday year, Lytham Lodge elected him as an honorary member to mark the occasion. Pip was joined by many senior Masons at the meeting to celebrate his jubilee. 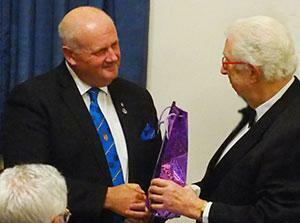 Leading was Assistant Provincial Grand Master David Winder. David had spent much time and effort compiling the story from which this report derives. Also supporting Pip was an old friend of his, grand officer Barry Cuttle, who moved a heartfelt and stirring toast at the festive board. Pictured from left to right, are: Chris Tittley, Barry Cuttle, Barry Fitzgerald, Ted Rhodes, Mike Goodwin, Raymond Firth, Pip Hayman, David Winder, Peter Bawden, Steven Reid, Eric Picton, Keith Jackson, Godfrey Hirst, Ian Ward, Jim Finnegan and Ben Gorry.